Board President Greg Hartmann sums up his budget in two words: austerity and growth. He says all departments will be asked to make reductions and anticipates some layoffs. Hartmann says 70 percent of his proposed budget focuses on public safety. He also plans to maintain spending levels for most economic development agencies though the Hamilton County Development Company's budget would be reduced. Commissioner Monzel's office indicates he will largely support Hartmann's plan. Meanwhile, Commissioner Todd Portune also plans to put forth a spending plan. He says his plan includes some across the board cuts as well but he's also looking at ways to increase other revenues. Portune says he's hoping to avoid layoffs. "We saw at Job and Family Services that we had to add revenues to support bringing on more people there over the past year because the cuts that they had been subjected to had gotten to the point where they simply were not able to keep up and bad things were beginning to happen," he says. 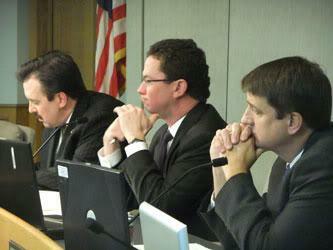 Commissioners are trying to plug an $18 million dollar budget shortfall for 2013. Board President Hartmann says he wants to vote on a budget November 14th.